As parents, taking a family vacation doesn’t mean you get away from the everyday stress of lugging everything you need from your child. In fact, it’s even more stressful because of the unknowns of traveling with kids. From flat tires to flight delays, you want to be prepared for every situation that you may encounter. 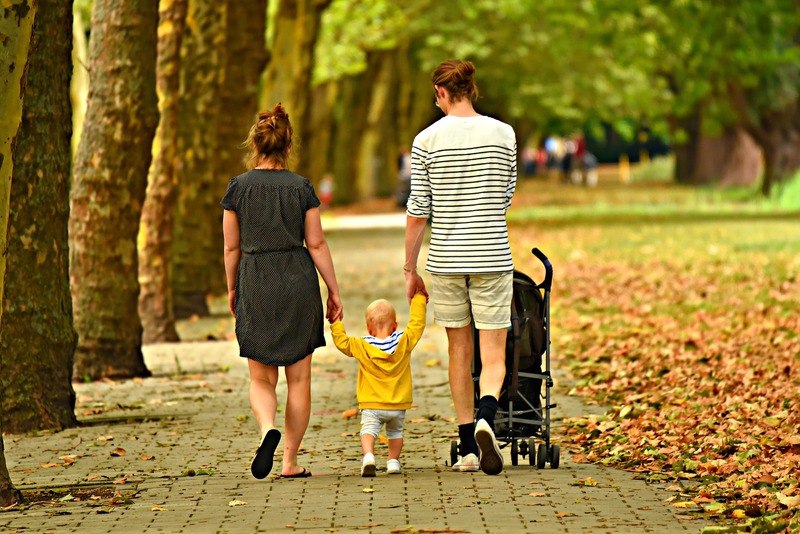 Having one of the best travel strollers is one of the biggest components in determining how much you enjoy your next family vacation. Because finding the best travel stroller for your needs can be difficult, we’ve selected our top 5 picks and outlined the most important features to consider for your stroller. Coming in at just under $50, The Summer Infant 3D Mini Umbrella stroller is hands-down the best for your money. 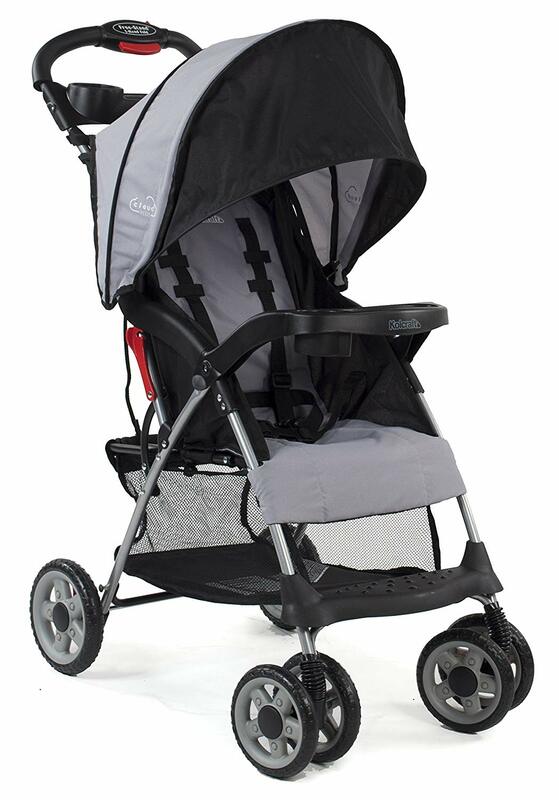 This comfortable stroller comes with a padded seat and a multi-level reclining seat. It keeps your child secure with a five-point harness and rear wheel breaks. Storage includes an under-the-seat basket, a pouch and two cup holders. The Summer Infant 3D Mini comes in at under 11lbs and folds up nicely for small areas. Large canopy: The canopy is big enough to block out sun or rain. Multiple storage options: The cup holders, pouches and storage basket give you plenty of room to keep everything you need for your child close by. Price: You get a lot of bang for your buck with this inexpensive travel stroller. Reclining seat: Your child will be comfortable in this seat. 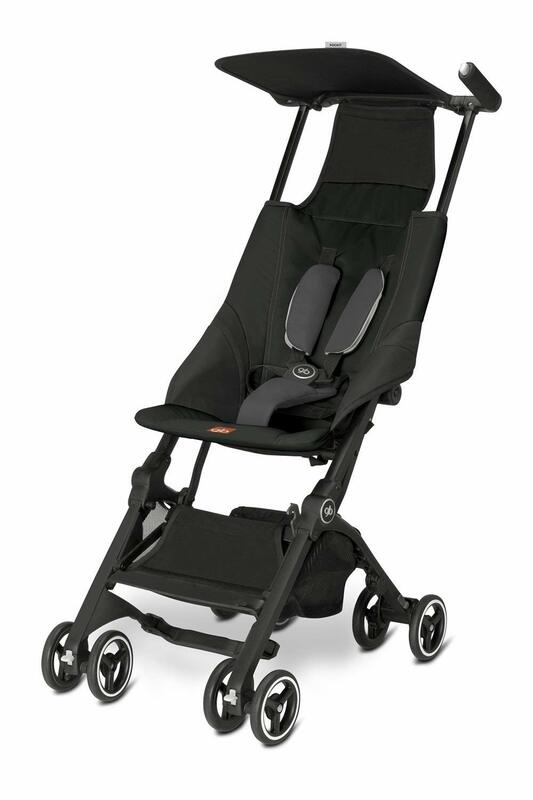 Maximum child weight: This stroller is designed for infants, so the maximum weight is 45lbs. Kolocraft’s Cloud Plus Lightweight Stroller combines the best features for the parents with safety and comfort features for the child, making it one of the best travel strollers if you love extra features. This particular model has a roomy storage compartment for the biggest diaper bags. It also comes with two cup holders and an extra storage pocket, which are great for things like walking around theme parks. At 11.8 pounds, the Kolocraft is considerably light with all these features. This is quite rare in even the best travel strollers. Easy one-hand fold: This feature makes it easy to hold your baby or toddler on one hand and stroller on the other. Five-point harness: The Kolocraft Cloud Plus has a five-point harness that is great for fidgety toddlers and secure for unexpected bumps in the road. Good storage: The storage compartment, cup holders and pockets are great if you need a lot with you. Large canopy: You can keep an eye on your child through the peek-a-boo window on the generous canopy that keeps the sun away. Price: You get a lot for the money. Reclining seat: This feature will ensure your child gets a comfy nap. None! : We love this! It’s truly one of the best travel strollers available. For your air travel needs, check out the Besrey baby stroller. This foldable stroller is designed to fit directly in the overhead compartment of an airplane. 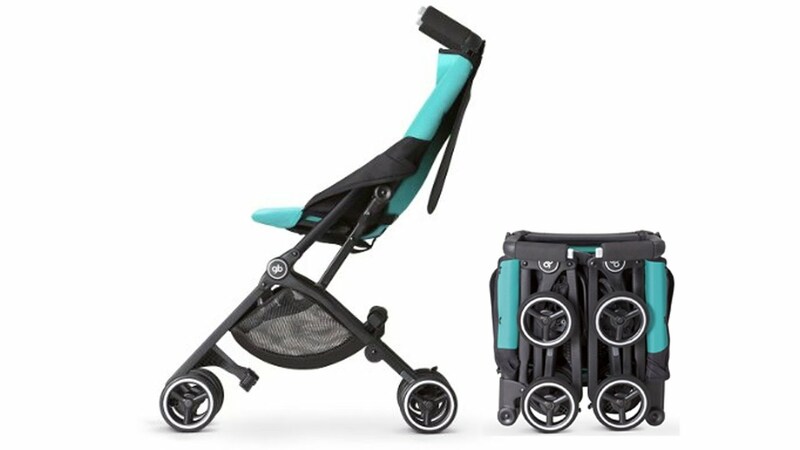 Its convenient one-button folding system lets you pull the stroller just like carry-on luggage so it stands up on its own too. This makes it easy to carry a baby in one hand and the stroller in another. The Besrey also has all the comfort features for baby, including adjustable backrest and footrests, a large canopy with peek-a-boo window and a padded five-point harness to keep baby safe. And as a bonus, it comes with a rain cover! Fits in an overhead compartment: One of the reasons that this is among the best travel strollers is because you can fold it up and put it in the overhead compartment of an airplane, saving you the hassle of a bigger stroller. Folds up with one hand: This feature is helpful when your other hands are busy holding your child. Large canopy with peek-a-boo window: This lets you keep an eye on your child even when the canopy is up. Less affordable: While this is a great stroller and a good value, others on our list of best travel strollers are less expensive. Heavier than most: At 15 lbs, this stroller isn’t as light as many others. 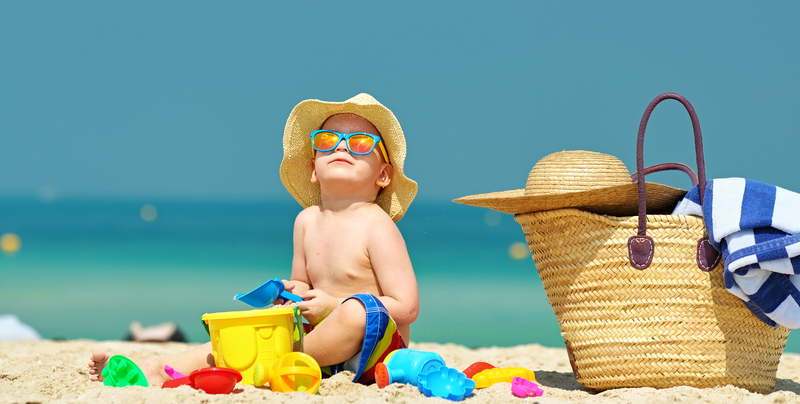 If you are traveling with twins or two children who are close in age, you will need that fits both of them. The biggest question when choosing a double stroller is if you want one that is side by side or one that is single file. Double strollers that are side by side usually have the same features on both sides. Both recline the same way and have the same amount of storage. On the downside, the width of the stroller makes it harder to get through narrow doors or hallway. Single file or tandem strollers are narrower, so it’s easier to get through doors. However, depending on how it’s set up, it’s harder for the parent to access the child that is sitting the furthest. Some of the single file double strollers may not have the same features on both seats. J is for Jeep Brand Scout Double Stroller wins in this category by being the best of both worlds. 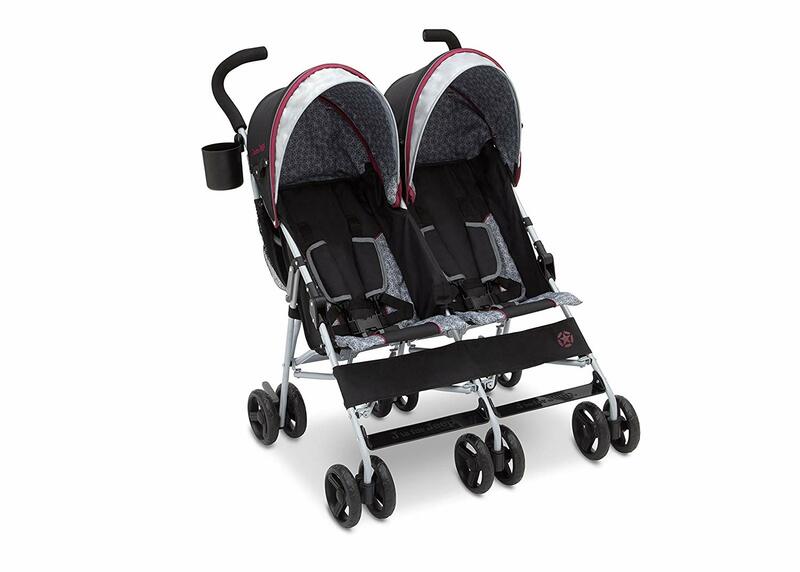 The J is for Jeep double stroller has front swivel wheels and a suspension system. The multi-level reclining is great for nap time. Compact when folded: Some double strollers are big even when folded. This one is more compact. Fits children up to three-years-old: The ability to use this stroller for several years can save you money in the long run instead of buying new strollers are your children age. Fits through 30” doorway: Some double strollers can be hard to get through doors. You won’t have to worry about most doors with this option. Large canopy: Not only does this have a large canopy to cover both babies, it has reflective material on it to ensure it could be seen at night. Parent cup holder: You can keep your drink close at hand, something that is particularly helpful when you’re traveling. Bag storage: Basket storage tends to be more convenient and keeps things out the way. Weight: This stroller weights 18.5 lbs, which is understandable for a double stroller, but it can sometimes be hard to carry if you’re needing to carry children too. Would you believe that there is a travel stroller that could fold up so small that it could if in your large purse? Well, here it is! The GB Pockit wins for best lightweight stroller weighing in at only 9.5 pounds. It folds down to 11.8”x7”x13.8 inches. Yes, it can fit into a large purse. Needless to say, it will have no trouble fitting in an overhead compartment on a plane, train or stowing in a compact car. Even though it is lightweight and compact, it is strong enough to hold a child up to 55lbs. GB sells a bag you can put it in or you can use your own. However, the lightweight and compact features, you do give up some of the other features that other travel strollers provide. The storage basket is small and won’t accommodate much more than a diaper bag. Folds neatly in two steps: Unlike some strollers that have complicated steps to fold it, this stroller keeps it simple. Five-point harness: The sturdy five-point harness keeps baby safe and includes a quick release button. Lightweight: This stroller is only 9.5 pounds, but it can still hold up to 55 lbs. Most compact stroller: The BG Pocket holds the 2014 Guinness World Record for the most compact stroller. 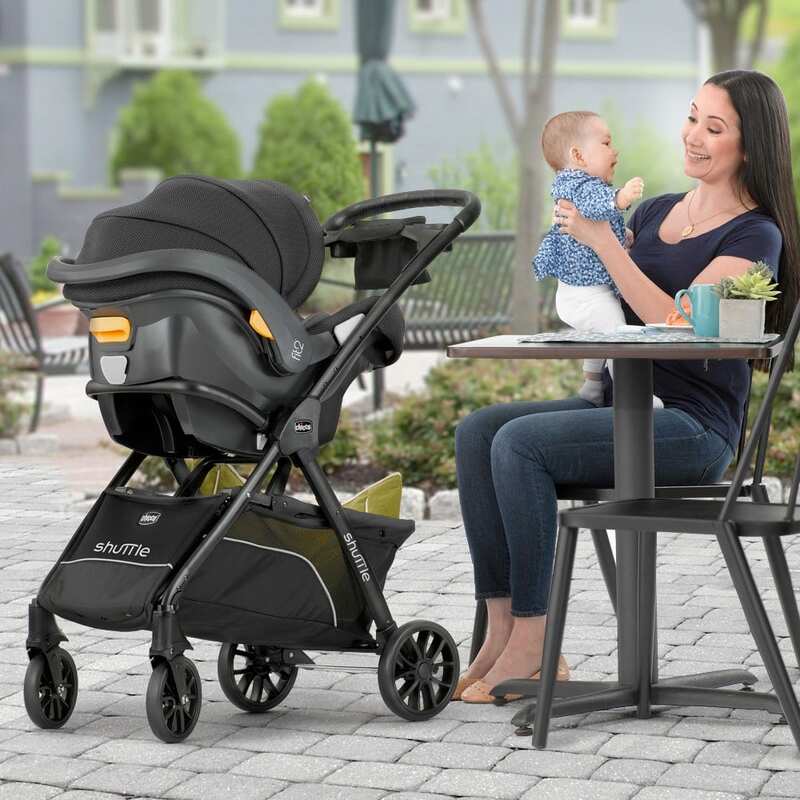 Small canopy: Where other travel strollers have a generous canopy that practically engulfs baby for sun protection, the GB Pocket only has a sunshade that lies horizontally. Small storage: If you carry a lot of items with you, you might not have enough storage space with this option. The features of travel strollers slightly differ from everyday strollers. Notably, you will want something that is lightweight and compact while still having enough storage. You also need a stroller that will work with the situations you will experience. For example, if you are traveling on a plane, which stroller can fit in the overhead compartment? Technology and design have come a long way, and these travel strollers are pretty impressive! Comfort: A reclining seat and a comfortable canopy can keep your child comfortable. Folding: Can it be folded with one hand? Is the process simple, or will it take you a few minutes? Storage: Check for diaper bag storage, cup holders and snack tray if those features are important to you. Weight and size: The lighter and smaller, the better, particularly when you’re traveling. Weight of child: All strollers have a weight limit. 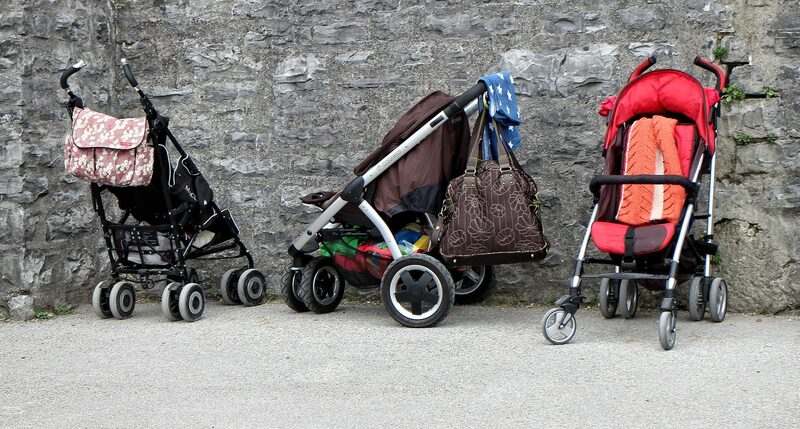 If you have children, can your stroller fit all of them that need to be in a stroller? Looking at these features can help you decide what items are most important to you. Even the best travel strollers might not have everything you want, but you can prioritize your list based on your most important needs. There are two types of strollers most commonly used when people are traveling: umbrella strollers or fold-up strollers. However, other types of strollers are available. Check out the differences for all your traveling needs. Umbrella strollers are called this because they fold up compactly just like an umbrella does. This makes umbrella strollers some of the best travel strollers. These strollers usually give up the features of a regular stroller to make them more lightweight. Some of these features include reclining back for napping, full canopy to shield baby from the sun or useful storage compartments. However, umbrella strollers are still useful in helping transfer kids back and forth through airports or parks. Umbrella strollers typically weigh less than 15 pounds. Anything over than this defeats the purpose of having something lightweight for travel. Some umbrella strollers are as light as 9.5 pounds! To figure out what size you need, try to determine the tightest space you need the stroller to fit in. Is it in the back of a compact car, or does it need to go in the overhead compartment of an airplane? The general rule for overhead compartments is that it should not exceed 45 inches total (combining length, with and height). The GB Pockit mentioned above measures 11.8 inches x 7 inches x 13.8 inches. That means 33 inches total, way below the 45 inches that most airlines accept. That’s why it fits into a large purse. 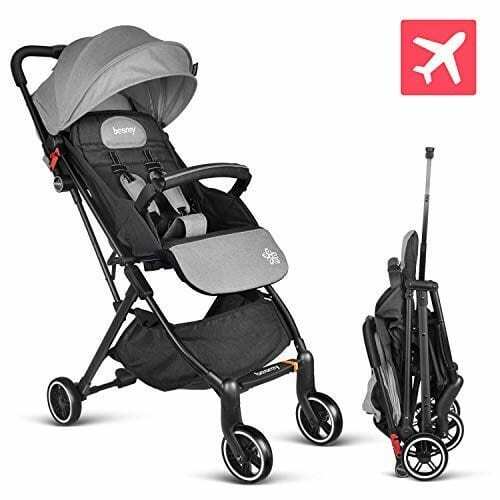 Specific airlines line JetBlue, U.S. Airways, American Airlines and United all note that the folded stroller can’t exceed 22 x 14 x 9 inches / 56 x 36 x 23 centimeters (including handles and wheels). 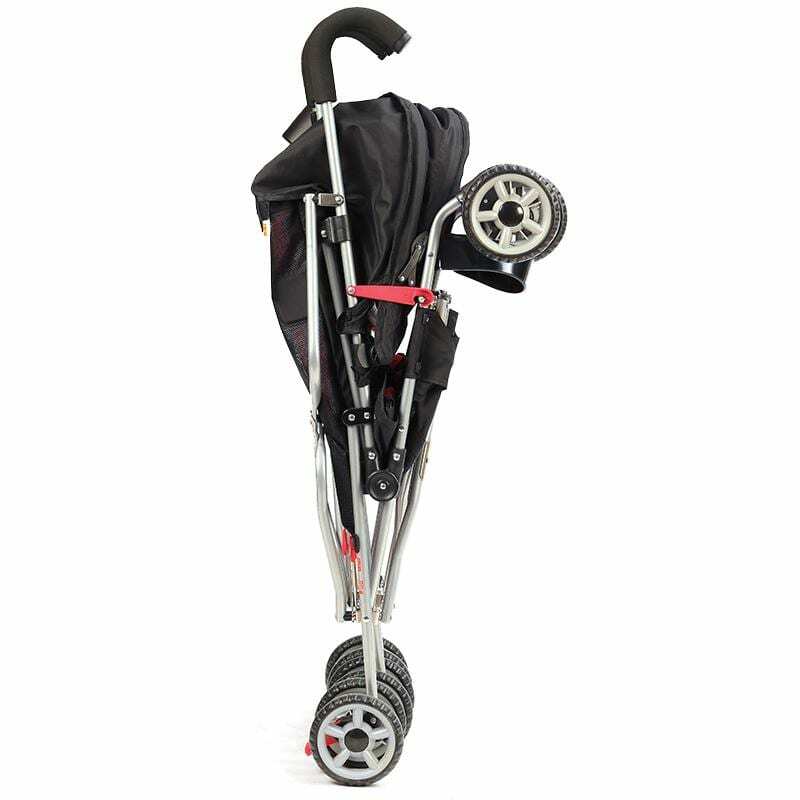 Umbrella strollers are generally easier to use and maneuver because they are made to be lightweight and fold quickly. These strollers need to be able to be carried with one hand because either you are carrying a baby or holding a toddler’s hand. Umbrella strollers come in many different price ranges. You can buy one as cheap as 14 dollars or for as expensive as 200 dollars. Many great umbrella strollers can have significant features and fit in the middle of this price range. The first thing you need to consider before choosing a stroller is the weight of the child. An inexpensive umbrella stroller with no recline, canopy, and a one-point belt will only take the weight of a 40-pound child. A higher-end stroller can handle as much as 55 pounds. A fold-up stroller isn’t necessarily made for traveling and can have more features than an umbrella stroller. These strollers make for great everyday options for going to the park or grocery shopping. 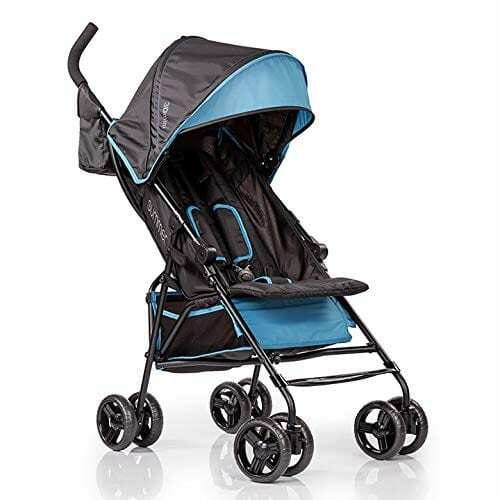 Features you want to look more in a folder stroller are comfort features like reclining and large storage space. In addition, look for removable cushions and snack trays for easy cleaning. Due to the additional features, a fold-up stroller will typically be heavier and bulkier than an umbrella stroller. Fold-up strollers can weigh anywhere from 15 pounds to up to 35 pounds. However, fold-up strollers can usually handle much more weight than an umbrella stroller can, making them the best travel strollers for older children. Easy maneuvering is made possible by swivel wheels on most strollers. But you also want to look for features such as an adjustable height for the handlebar. This will ensure it’s comfortable for you as well. Cost can vary greatly in this category. A City Mini by Baby Jogger can cost as low as $250 while a Bugaboo Donkey what converts as your child grows can cost up to $1,300. If your baby is still in an infant car seat, you might also want to consider a frame stroller. This is where you can snap the baby’s car seat onto this structure and it turns into a stroller. This is arguably one of the best additions to the stroller world. Why? Because it lets you move baby from the car to the stroller without ever taking them out of the seat and waking them up. This is a lifesaver for when you want your baby to sleep at a certain time, or when you are moving from plane to train to a car. Baby Trend makes the universal Snap-N-Go that you can use with almost any car seat brand. However, individual baby stroller brands also make their own frame stroller. You should consider this option when you shop for a car seat. Because the car seats take up most of the space, the storage area for frame strollers is pretty great. There are also double frame strollers for twins! If you are considering the Rolls Royce of strollers, check out brands such as UPPABaby or Bugaboo. These brands make super sleek strollers with awesome additional features. Bugaboo offers an adjustable handlebar, one hand recline, a reversible seat (can face forward or toward the parent) and even a two-wheel beach mode for pushing through the sand! These beautifully designed strollers also come with a gorgeous bassinet with removable liners and even a toddler seat. Some of the systems accommodate up to three kids without growing wider. These features clearly can make some of the best travel strollers. But of course, these cool features come at a price. They can cost as much as 1,400 dollars, so make sure that these strollers fit your needs and will grow with your child. These days, there are some additional options for carrying a child while traveling that you might consider. A different type of travel stroller option could be Lugabug. This particular item is more like an attachment for your luggage. The child sits on the seat. The best thing about the Lugabug is that you don’t have to push a stroller and luggage at the same time! It is extremely compact, and you can either put away flat or fold it up like a tube. It is only 1.1 pounds on its own! The Lugabug is recommended for toddlers over two-years-old and it can handle up to 60 pounds. It also acts as a seat for the child when propped on the floor. This is great for waiting in lines or camping. Note that this type of attachment isn’t an option for a sleeping toddler and doesn’t have storage like a regular stroller. It’s strictly for getting a child from point A to point B quickly. Similar to the Lugabug type of attachment, you could also consider kids luggage that kids can ride on. Products like Trunkie are a great example. This kid’s luggage has great storage for their snacks and toys, kids can pull the luggage themselves or children can sit on it and have an adult pull them! It weighs just under five pounds and can fit in an overhead compartment on an airplane. The Trunki can handle up to 75 pounds and comes in a variety of fun colors. Clearly, there are many options when it comes to traveling with children. With advances in design, most of the basic features can be covered in even the smallest, most lightweight travel strollers. Consider your lifestyle first, then use these guides to help your decision making when choosing from the best travel strollers available. Arianny is the creator of Prep and Shine, which focuses on being prepared for all of life’s wonderful moments. From preparing meals for the week ahead to preparing for our next family vacation, you can find it here. She has an extensive library of homemade baby food and food allergy tips as her daughter was born allergic to 8 foods. Arianny is a Fordham graduate and has an extensive background in television marketing. She’s worked for History, A&E, Lifetime, and is currently Sr. Manager of Creative Operations at truTV. Her international television experience has given her incredible experiences and hopes to expose her children to the world just the same. 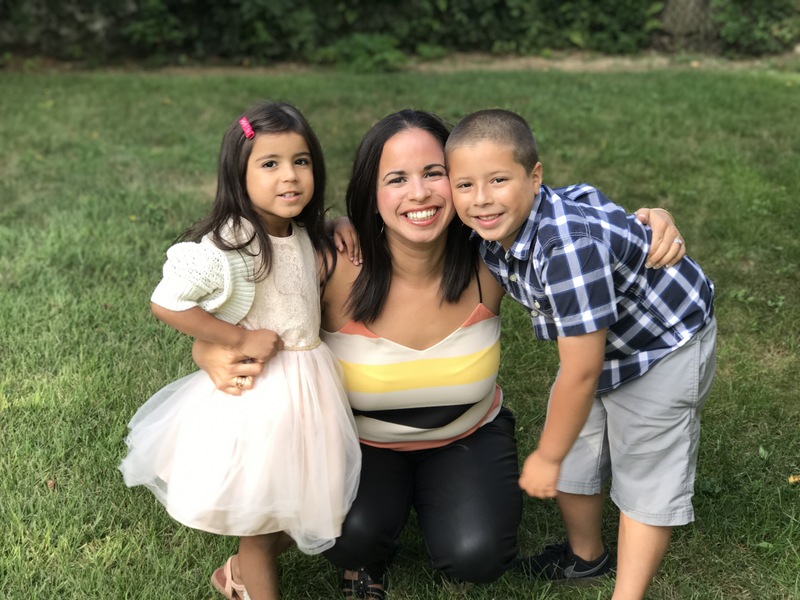 Her children have had their passports since they were 6 months old and the family also speaks Spanish. Check out her favorite recipes, family tips, and travel strategies that will make your life a little bit easier.